Yesterday afternoon after taking a shower, John Pilkington gave me a ride to the storage unit in Solana Beach where my car and other stuff were stored. Found out that my car wouldn’t start, dead battery. We used my jumper cables but still did not start. John had to leave and I got a Booster unit from the manager but that was dead too. Called AAA and the technician used his Booster unit to start the car and told me the battery would need a full charge. I called the recommended auto shop in Encinitas and just made it there before they closed and left the car with them overnight. The following morning the shop put the charger on my battery all morning but it still would not start, bad battery! Ended up having to buy a battery but at least I knew my car would be dependable again. Had lunch and a frapuccino at my old Starbucks hangout in Cardiff by the Sea which had been totally remodeled then went to the ElliptiGO office to check with Erika about putting a rack on the trunk of my car so I can take the ElliptiGO to my next two in-studio TV interviews, one Monday in San Diego and the other Wednesday in Hollywood. 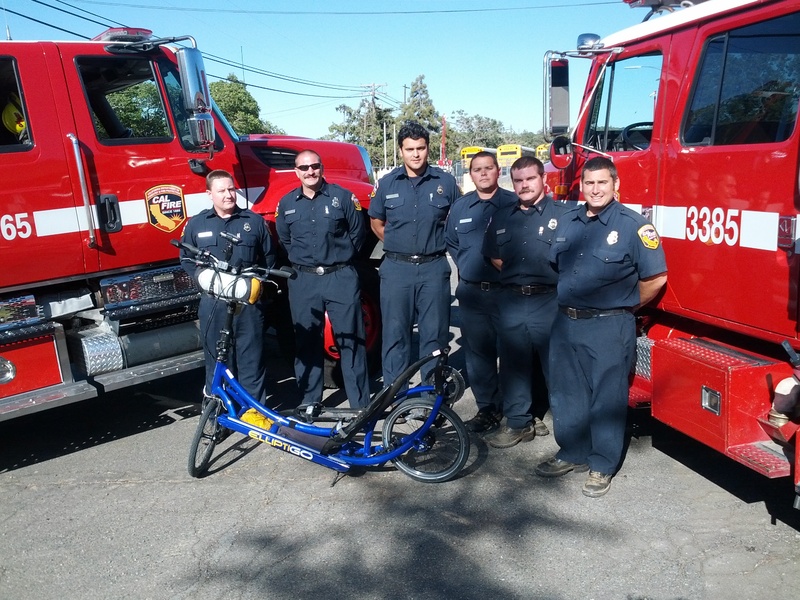 With Bryan’s help we figured out how to mount and secure the ElliptiGO on the rack. After that I went back to the storage unit site and changed from a 10 x 25 unit to a 10 x 5 unit and got everything remaining moved over. For dinner I met with Bob and Kay Miller from Camarillo, CA at Fidel’s Mexican Restaurant across the street from the ElliptiGO office building. It was through Bob that I first learned about the ElliptiGO. He has had his for just over two years. 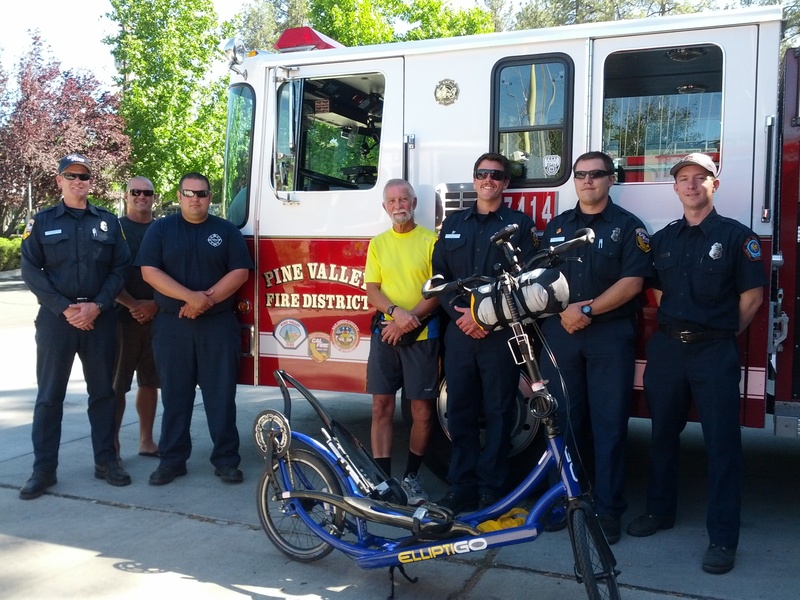 He is also the one who let ElliptiGO know about my idea of going coast to coast on one of their machines. This is a picture of them tonight at Fidel’s. Got up at 4 am to do a 4 mile fast walk with my host Margie and her friend Marylee around their neighborhood, all hills. That took just about an hour. At about 8:40 am John Pilkington and Jorge Lee arrived on their ElliptiGOs to ride back to Solana Beach with me. It was mostly downhill with one short but steep hill at around 4 1/2 miles. It only took us an hour to do the 12.4 miles. 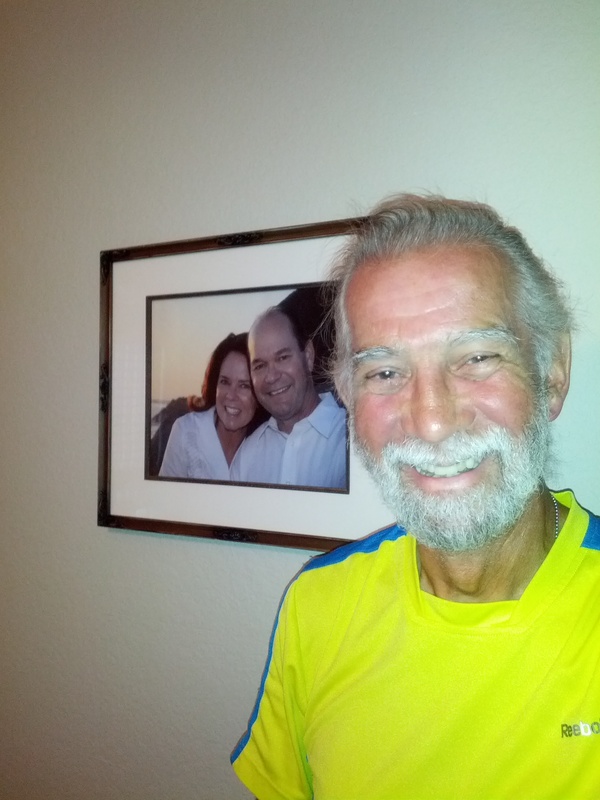 John Pilkington and his family are hosting me for the last three days of the ride. Here is a shot of me with John and Anita. Started the day with a good breakfast with some of the Ramona Fire Station crew members. Erika Nelson from ElliptiGO Inc. arriver around 8:30 am with her camera and I started the trip with her shooting my departure from the station. Erika then drove ahead a bit and set up her camera for more shots and continued this for the next 12 miles of the 15 mile ride. I then continued on to my friend Margie’s house where I was met by her younger daughter. Spent the afternoon taking care of things until Margie and her husband Paul arrived. 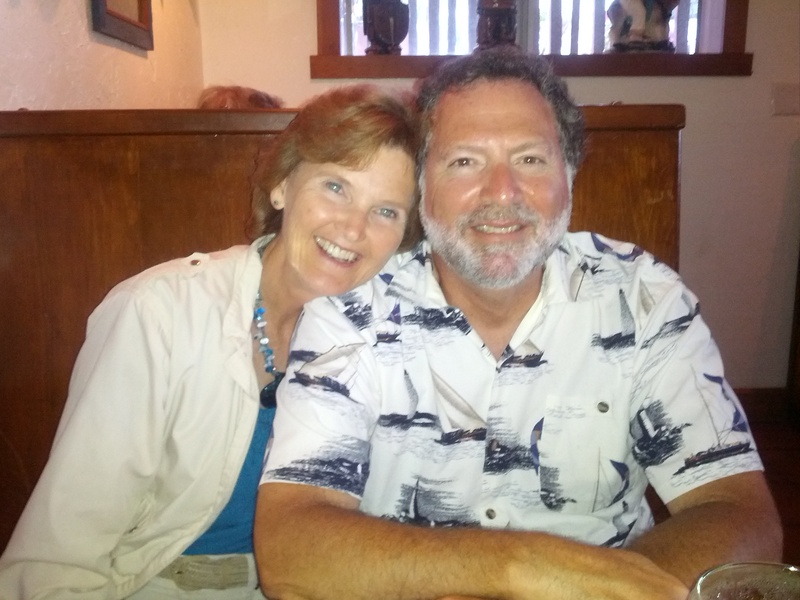 We had a nice dinner and caught up with events in our lives this last few months. NOTICE: A FEW HOURS AGO A COUPLE OF BIG DONATIONS PUT THE FUND RAISING FOR THE INJURED MARINE SEMPER FI FUND OVER THE $10,000 LIMIT. WHEN ASKED WHAT IF IT WENT OVER THE LIMIT, MY ANSWER HAS BEEN THAT THE MORE THE BETTER. PLEASE KEEP THE DONATIONS COMING IN AND KEEP SUPPORTING A VERY WORTHY CAUSE. 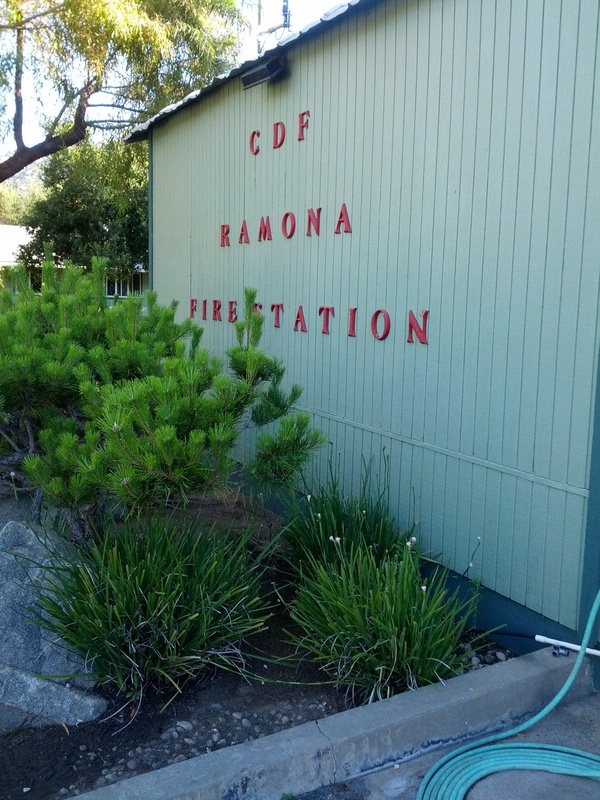 After a good breakfast with the Julian Fire Station crew, I took off for Ramona a bit after 8:30 am. Did not need to leave as early because today’s ride was mostly downhill, there were still a few climbs including the last 5 miles but still finished in just over 2 hours for the 29 miles. 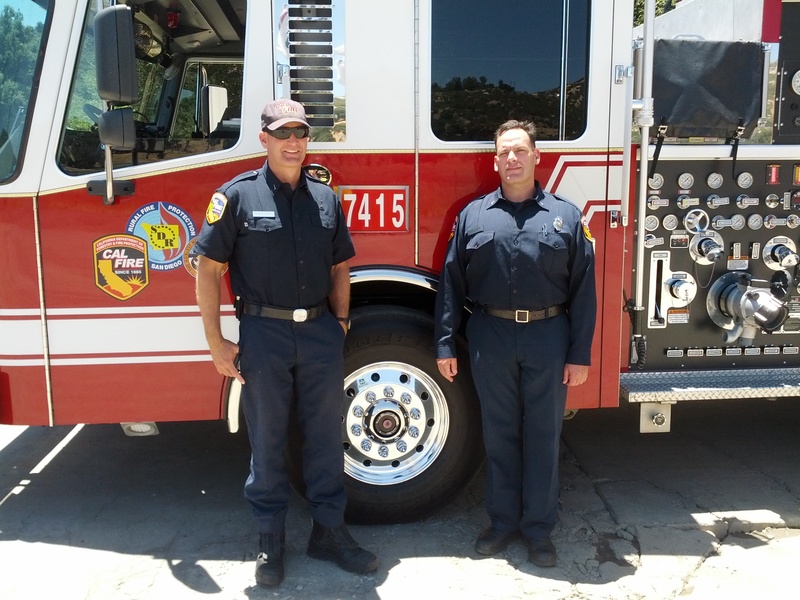 Arrived at the fire station in Ramona in time to join them for lunch. Captain Cesar Nerey and his crew follow an old tradition at their station of putting on their dress shirts for meals. This is the only station of the many I have stayed in that have that tradition. They observed the same tradition for dinner. After dinner most of the crew took turns trying out the ElliptiGO. They were all surprised at how easy it was to get the hang of it. I would like to mention that this is the 53rd Fire and/or EMS Station to host me, directly or indirectly, during my trip across the country. The first four days I was hosted by families and individuals and the same applies for the last four remaining days. When I started back on March 23rd, I only had three days where someone had committed to host me, now near the end I am happy to say that I have been hosted every single day of the 100 day trip. The main theme of my trip has been “100 Days for the Corps” and a while back I added the sub-theme “Fire Stations Across America”, this was when I was only about half way across in anticipation that I would continue to be hosted by more along the remaining states. Now that I am almost to the end of the trip, that anticipation has become a reality. 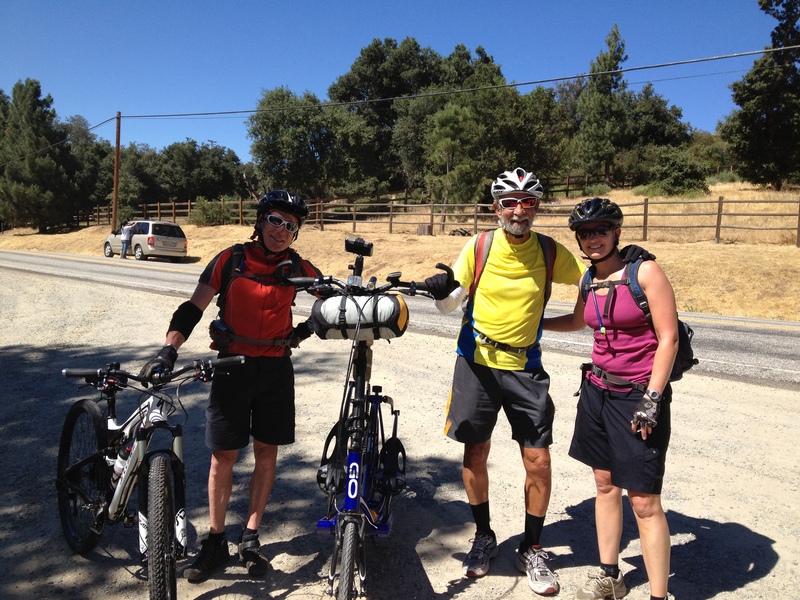 As I mentioned yesterday, I had missed a turnoff and went about 3 miles further on Hwy 79 when I met some dirt-bike riders that gave me directions to get to Descanso, here is a picture one of them took of the other two riders and me. 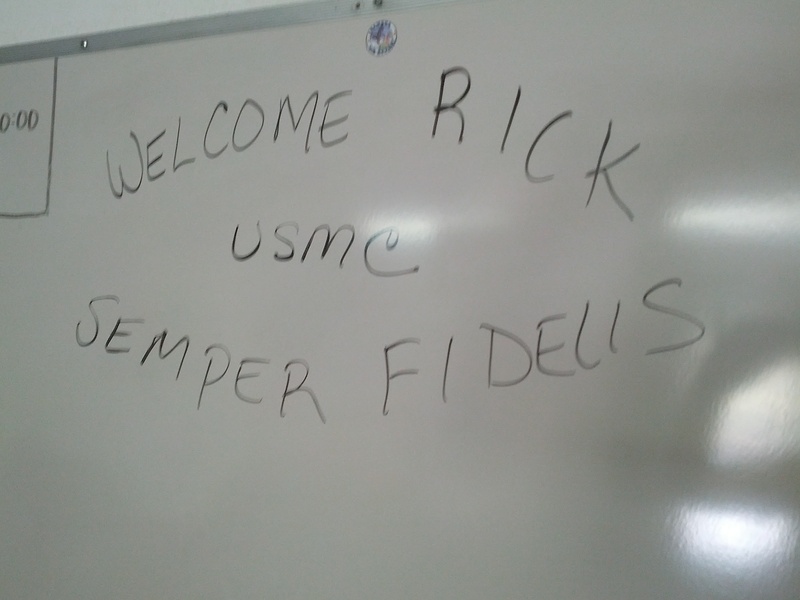 When I arrived at the Descanso Fire Station this is the message Zack and Rick had put up on their white board and also a picture of them. Left Descanso a bit after 7 am expecting a tough ride. 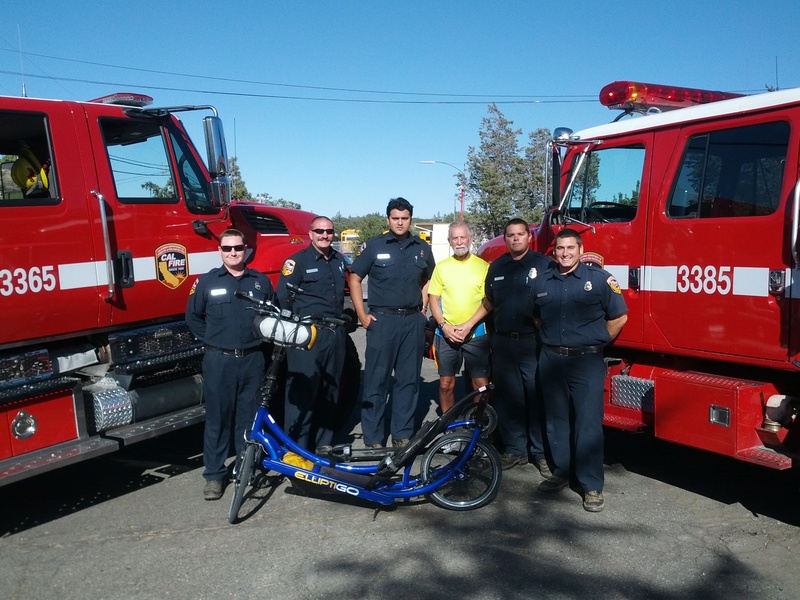 The first 10 miles were mostly uphill until I got to the Guyamaca CalFire Fire Station where I stopped to say hello. This is the oldest Fire Station in California having been established in 1934. The crew members invited me to stay for breakfast with them and I could not pass up the offer. It was delicious! The remaining 11 1/2 miles to Julian were mostly flat or downhill with just a few climbs After settling in and taking a shower I had a sandwich for lunch and then took a short walk to the central Julian area where I had a slice of apple pie which Julian is famous for. Tomorrow’s ride to Ramona will be mostly downhill, a drop of about 2800 feet over 22 miles, so should only take me about an hour and a half and I will not leave as early. Here are a couple of pictures of the Julian crew members. Took my time this morning because today’s ride would only be around 7 miles and I did not want to arrive too early so left a bit after 9 am. Ended up missing a turnoff and overshooting my ride on Hwy 79 by over a mile, mostly uphill, and doing almost 13 miles. At least I have an idea what I will face at the start of my ride tomorrow. The name of this town, Descanso, means “rest” in spanish and that’s what I will mostly do all day. Even with the extra miles it still only took a bit under an hour and a quarter to cover the distance. The fire station doesn’t have WiFi and my Verizon signal is very weak so I am using the local library’s WiFi which is located just a short distance from the station. The library is closed today, it’s Sunday, so I am doing this blog while sitting in the shade on a bench just outside the entrance. Because the Verizon signal is so weak, I cannot send the pictures of the crew from my cell phone to my computer so I will post them in tomorrow’s blog. Today’s ride was still tough but much cooler. Figured out that from west Texas to Ocotillo, CA I had spent 42 days in the desert. It felt good to feel cool air most of the way today. I stopped a couple of times to talk to people on the road about my trip. 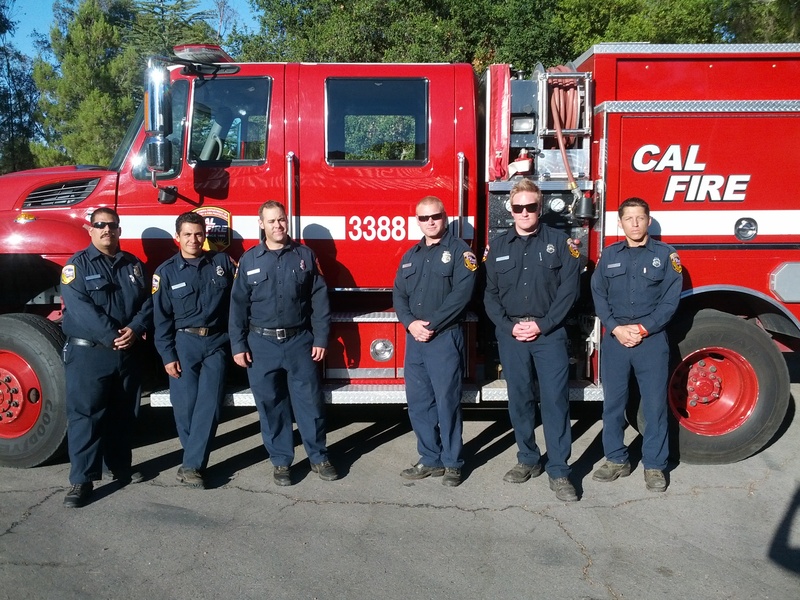 Some of the members of the Descanso Fire Station, where I go tomorrow, came over to visit and later Captain Custeau came by with his wife and two children and cooked a great dinner for all of us. His wife took this picture of us.